Butterflies, bioswale…and of course, a little less turf grass! 07 Oct Butterflies, bioswale…and of course, a little less turf grass! 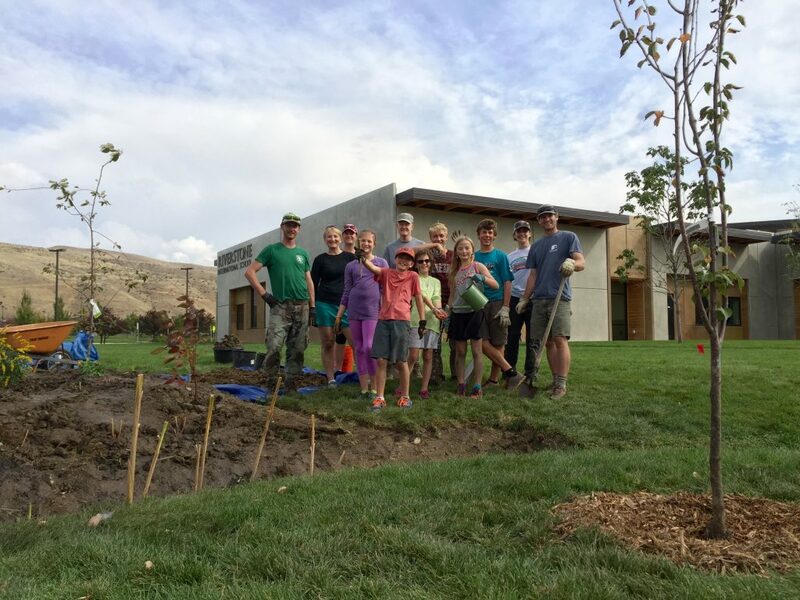 Last weekend I had the pleasure of coordinating the installation of a Butterfly and Pollinator Garden with the Riverstone Outdoor Program and Ben Brock, the director of the program. We found a piece of campus that with small changes would have a big impact on the grounds as a whole. 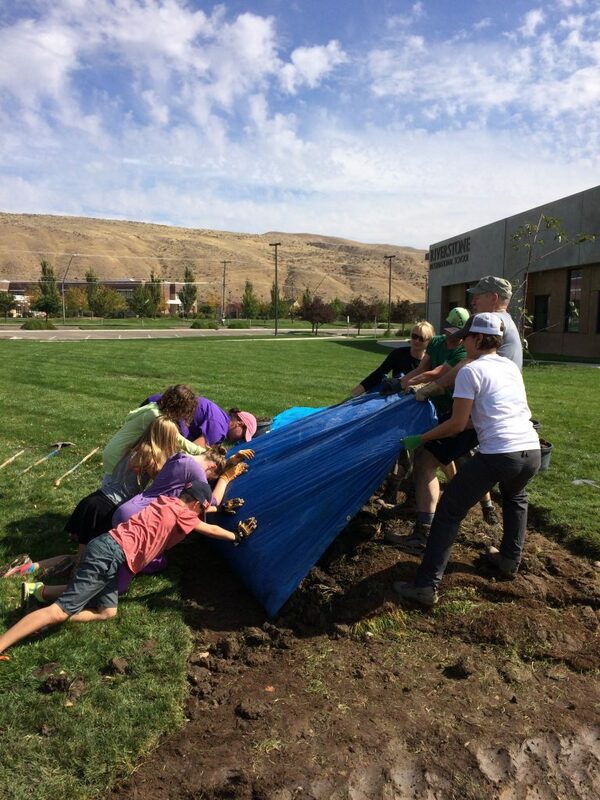 Along the parking lot and draining towards the Elementary school was a ditch (swale) that was intended to capture the rain runoff and allow for percolation in to the water table below – check out what ideas we had to improve it! 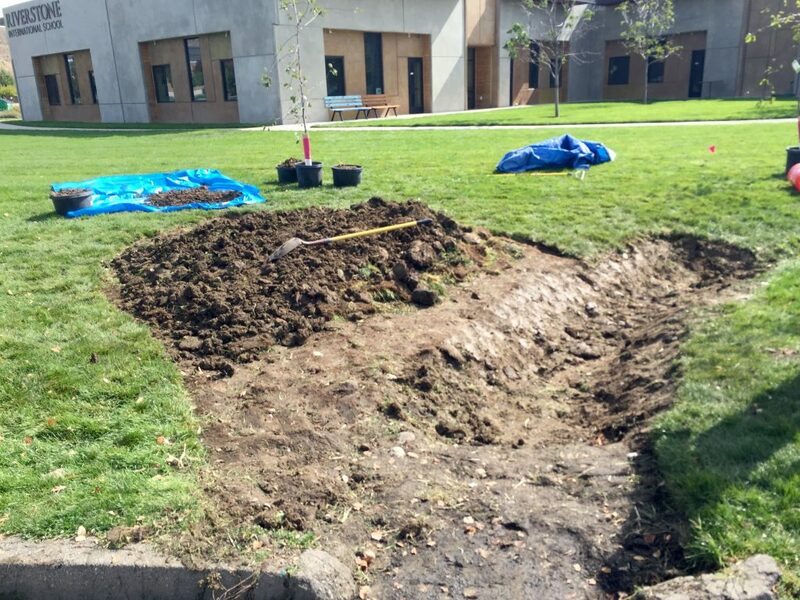 Why change the ditch/swale in the first place? The swale in its first draft was not quite large enough to handle a 10 year rainfall event and drain (it still needs to be bigger but we are making progress). 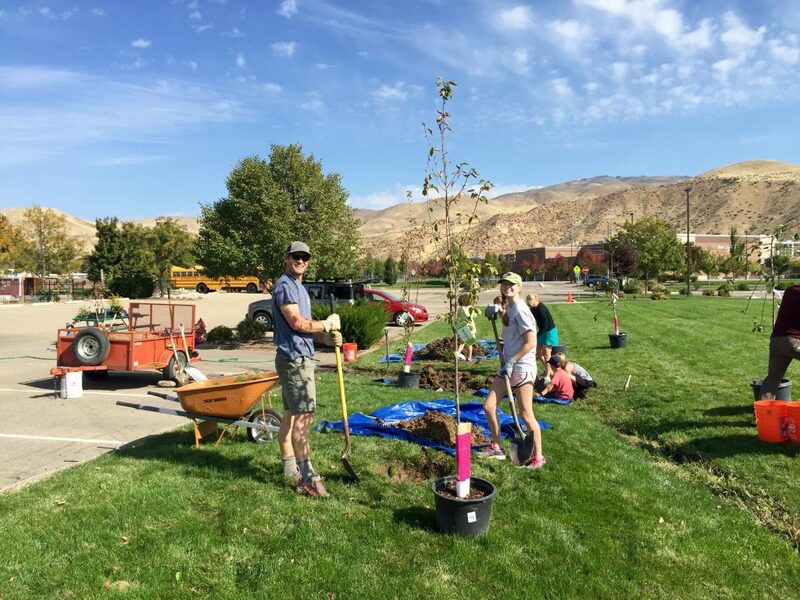 It was also simply a swale, and it was missing the bio component to be a bioswale and receive all the benefits from properly selected and placed plants. As it was, the ditch was a challenge for the maintenance team to mow and water would sometimes flow back into the parking lot, creating an mess. 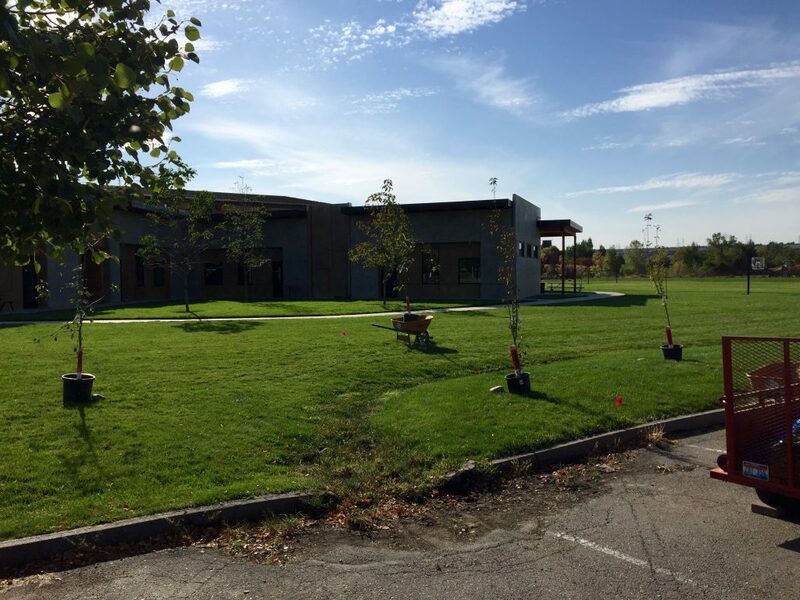 Todd, the lead of maintenance team, was great in working through this process to help create a vision that would not increase his maintenance load, while adding valuable habitat and a resource to the school. It is my vision that once this project is fully finished and scaled,the plant selection and design will reduce maintenance requirements. WAIT! 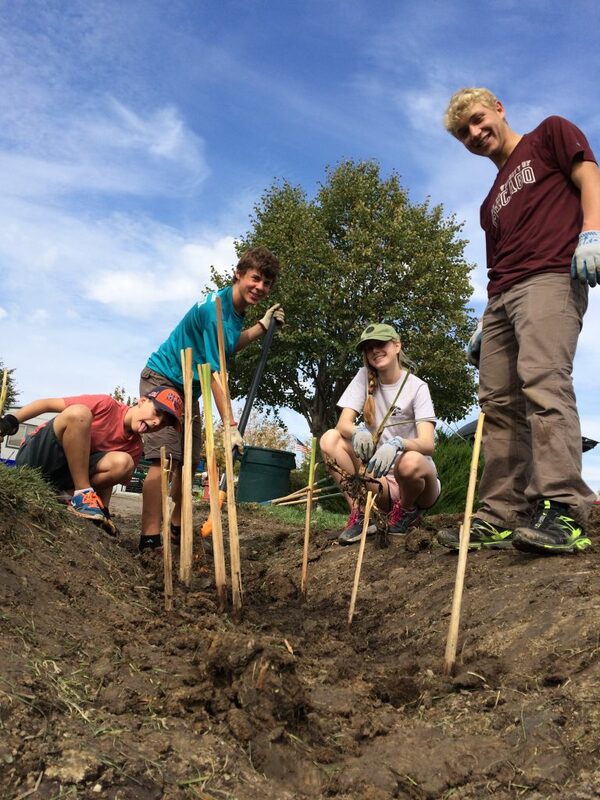 What is a bioswale? 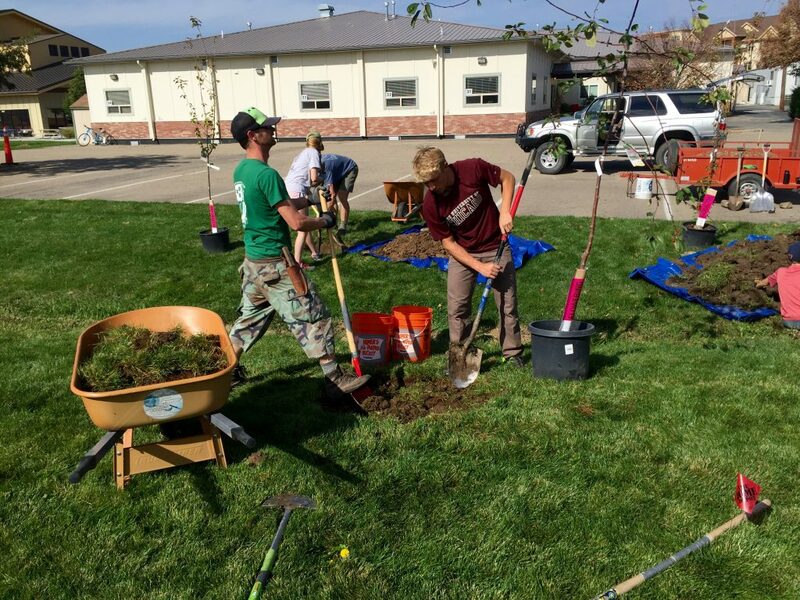 A bioswale is essentially a ditch planted with vegetation that captures surface runoff during storm events and holds (retains) it there while the water percolates into the ground, cleaning the runoff through a process called biofiltration. Many different processes help clean surface runoff. Some plants, such as cattails, directly absorb the pollutants through their roots. Physical structures also play a part; the densely populated stems of a developed swale slow the water velocity and ensure sufficient time for biotic (such as bacterial) and ionic (chemical) interaction to occur around the plant root zone. Two other forces that occur in swales to clean the water are flocculation and sedimentation. Flocculation is the process through which suspended fine particulates are clumped together, and it is facilitated by decomposing organic matter in the swale. In slow moving water, heavier sediments will fall out of solution – sedimentation. The trees should encourage better drainage through the creation of “root gutters” over time and the increased leaf area of the cattails should draw down standing water while purifying our runoff!! Once the swale is established it should purify and drain water at a much faster rate! So we have a swale, how to make it into a bioswale? Just add biota and change the shape? Pollinator gardens provide food to insects and birds in the form of nectar and pollen. A well designed pollinator garden has a variety of plants that bloom throughout the growing season to provide a continuous food source. This garden is elegant because it converted turf grass which was already under irrigation to a high value habitat for pollinators and wildlife. Remind me about the monarch butterfly again? The monarch butterfly lays its eggs exclusively on milkweed plants, so they can’t find a home just anywhere. Monarchs grow up and migrate south in an incredible journey to southern California or Mexico, where they congregate en masse. If you want to create monarch habitat in your pollinator garden, be sure to include at least one milkweed that can successfully host monarch eggs such as Asclepias speciosa (showy milkweed), the native host in this region. Showy milkweed, in addition to supporting all possible phases of the monarch life cycle locally, is reported to be less aggressive and weedy than Asclepias syriaca (common milkweed), the host milkweed in many regions, and is a very suitable landscape plant as long as its given space to create a patch. What is threatening the monarch? Many factors are negatively affecting monarch, the greatest of which is habitat loss. Three main causes of monarch habitat loss are: 1. Change in land management regimes such as widespread herbicide use, especially when used to reduce broadleaf plants (such as milkweed) in and around crop areas on which monarch depends. 2. Reduced Edge effect – smaller fields combined into larger fields means less “edge” area where milkweed and similar plants used to grow. 3. (Sub)urbanization – conversion of natural landscapes into agricultural fields and lawns reduces available potential habitat. Why are bees important to me? Why create pollinator gardens? 1 of 3 mouthfuls you eat has benefited directly or indirectly from honey bee pollination! Bees of all types account for 75% of all pollination of fruits, veggies and nuts in the US, according to the USDA. Pollinators are threatened across North America; monarch butterfly populations have decreased by 90% over the last 20 years and from 2006 to 2015 U.S. honey bee populations have dropped by 40%! Riverstone students pose with the swale, which is about to be “watered in” after excavating and planting cattails. Where are all the bees in the garden coming from? Does Riverstone have a hive? Riverstone does not have a hive on campus. Most of the bees that visit are not colony-building honey bees. They are solitary ground nesting bees. This garden is here to feed the native pollinators like solitary bees, butterflies, moths, beetles, birds and even pollinating flies. Why are the bees threatened? Nationally, many of our native solitary bees are currently threatened in their range or sections of their range, including the once common western bumblebee. There are many probable reasons for native bee decline such as habitat loss/fragmentation, introduced disease, and pesticide poisoning leading to drastically depressed bee populations and even many local extinctions within several ranges. The (introduced) honey bees are declining from what is termed Colony Collapse, which is likely due to all the above factors exacerbated by malnutrition from eating a monoculture of pollen for the entire season. Student and individual efforts in our community can contribute towards improving an international problem! It’s easy to plant landscapes that attract pollinators and provide habitat. 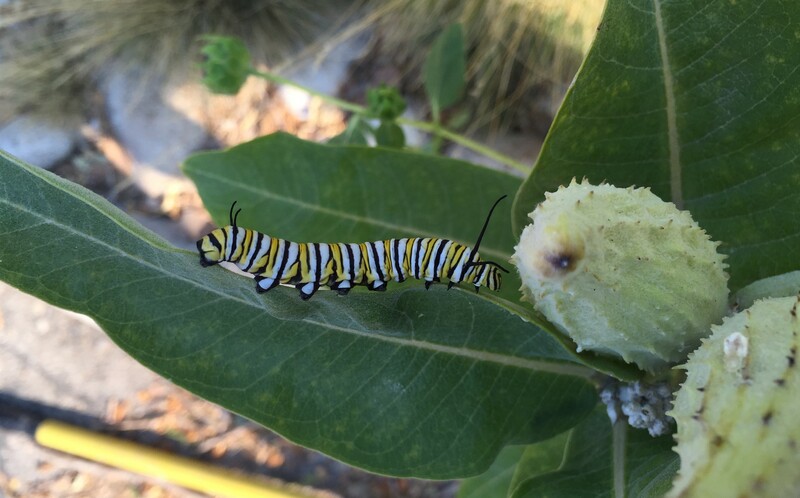 When designing a pollinator garden, ensure that you have room to plant large patches of each species (for example, plant a big patch of milkweed so a caterpillar can find a new stem if it falls off a plant). Ensure that plants are planted in the places that they will thrive, use native species whenever possible, and use shrubs and trees to block summer wind gusts and enable butterfly occupation. Also, choose a variety of flowering plants that will provide blooms throughout the entire growing season. Finally, reduce and avoid herbicide and pesticide use, if you must use a chemical ensure it is bee friendly and used in the most effective and least harmful way possible. What are the benefits to having a pollinator garden at my house? Pollinators like butterflies and hummingbirds are great to observe and the fruits of a pollinator garden like crabapples and choke cherries can be valuable to larger wildlife. Attracting pollinators to your landscape might also improve garden yields if you have vegetable garden or fruit trees! In addition to adding beauty and color to your landscape, a pollinator garden can provide crucial habitat and it is a good reason to convert some lawn into a feature, – let’s all water just a little less turf. Where can I get plants for a pollinator garden? 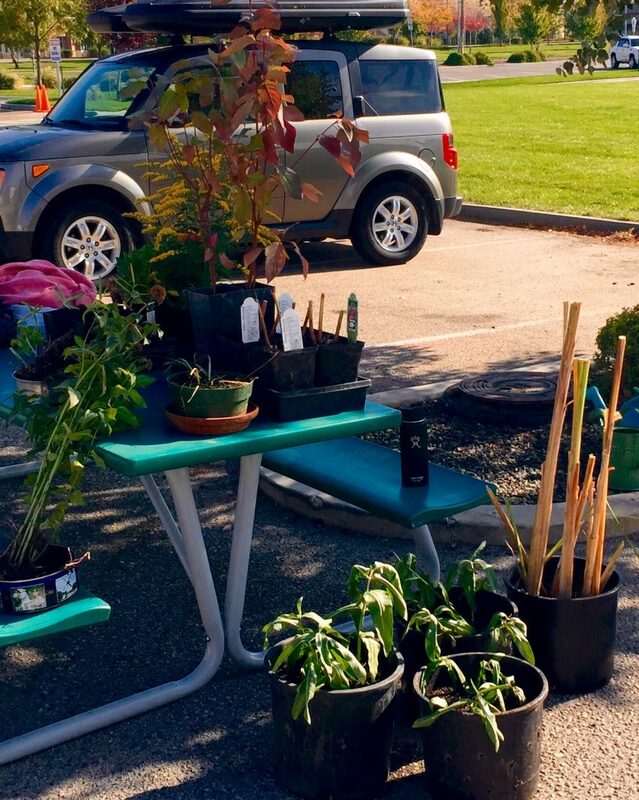 The best place to buy native plants in Boise is Draggin’ Wing Farm, or wait for the spring when both the Idaho Botanical Garden and the local chapter of the Idaho Native Plant Society put on native plant sales! You can find many garden varieties at most local nurseries that are acceptable as well. Home Depot, for example, graciously donated the trees for this project. 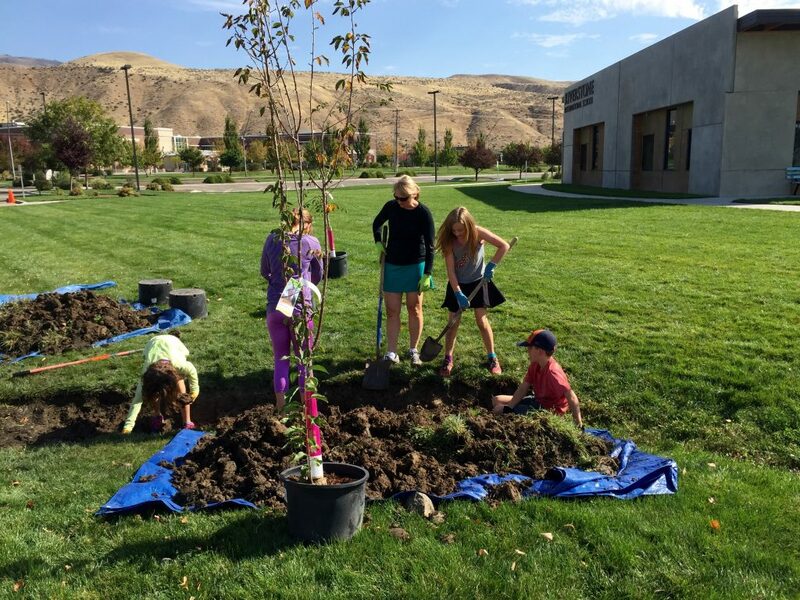 Are there other examples of pollinator and native plant gardens in the Boise area? Yes! 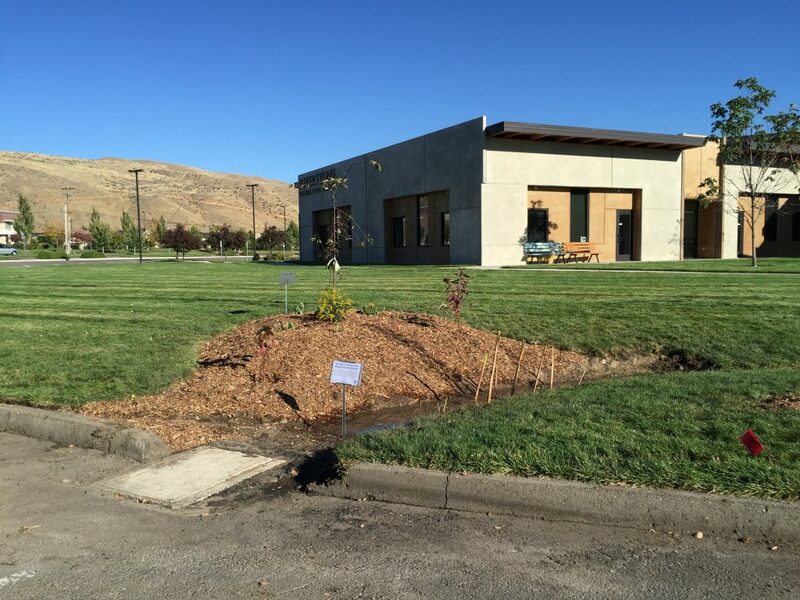 The Idaho Botanical Garden, the MK Nature Center, the Jim Hall Foothills Learning Center and many others have pollinator gardens and displays! Pollinators visiting rough goldenrod (Solidago rugosa ‘Fireworks’) in the garden the day after installation! Looks like the beginnings of a successful pollinator garden!